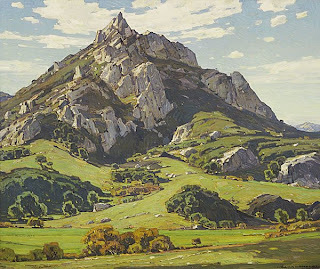 William Wendt was born in Bentzen, Germany on February 20, 1865. At the age of fifteen, he immigrated to America, working in Chicago as a staff artist and illustrator. He attended night classes at the Art Institute of Chicago, but was primarily a self-taught artist. While working as a commercial artist, Wendt was also exhibiting in Chicago area art shows where he won Second Place in the prestigious Charles T. Yerkes Competition from the Chicago Society of Artists in 1893. It was in Chicago he met the plein air painter, Gardner Symons. The two became friends and traveled to California to paint; it was the first of many trips there. They also traveled to the Saint Ives Art Colony in Cornwall, England in 1898. In 1906, Wendt married Julia Bracken, a sculptress. The couple moved to California where they spent the rest of their lives. In California, Wendt spent his time painting the landscape outdoors. His art was an extension of his religious beliefs. Wendt had a deep respect for untamed nature and found not only peace and comfort, but the manifestation of the Creator. His feelings are reflected in the titles of his paintings that use poetic— almost biblical style phrasing like, ‘Where Natures God has Wrought’ and ‘I Lifted Mine eyes to the Hills’. He became a founding member of the California Art Club, and in 1911 was elected as its 2nd President serving until 1914. He later served as President from 1917 to 1919. In 1912, the Wendt’s moved to Laguna Beach. He was a founding member of the Laguna Beach Art Association. Wendt was also elected to the National Academy of Design as an Associate Member the same year. During his career, Wendt won many prestigious awards including a Bronze Medal in the Pan American Exposition in Buffalo, New York, Silver Medals in the 1911 Louisiana Purchase Exposition and 1915 Pan-American Exposition in San Francisco and a Gold Medal in the 1925 Pan American Exposition in Los Angeles. During his lifetime, William Wendt became known as the Dean of the Southern California landscape painters. He influenced generations of painters with his monumental canvases filled with bold bravura brushwork, strong color and design. William Wendt died in Laguna Beach in 1946. From November 9, 2008 – February 8, 2009, The Laguna Art Museum will host In Nature’s Temple: The Life and Art of William Wendt. 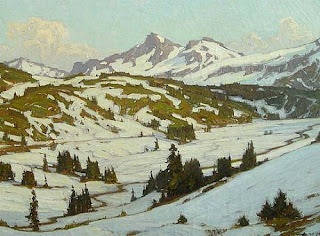 It will be the first, full-scale retrospective on the art of William Wendt. This exhibition will be accompanied by a major 164-page color catalogue with a 50-page essay by Guest curator, Dr. Will South. QuoteHere away from conflicting creeds and sects, away from the soul destroying hurly burly of life, it feels that the world is beautiful; that man is his brother; that God is good. I saw the show down in Laguna and really enjoyed it. Discovered this your blog because it came up on my Google Alerts. I love YOUR work too… recognized your name so came to see the blog. This blog is a cool idea to help us learn about the greats… Thanks.. I’ll be back! I have learned about some new painters which is always good. I think the list should also include Fran Vincent DuMond. I don’t think we’ve met, but we’ve been in some exhibitions together, really like your work. Maybe at the next one! Thanks for the great posts. Wendt was most likely a founding member of the CAC in 1909, but 1911 was when he became the second President. Thanks Eric, I’ve corrected my fuzzy sentence about Wendts first presidency in the Club.